With the release for WFFM 2.5 for Sitecore 7.5; SQL server is no longer supported (see release notes) as each time a form is submitted it automatically saves the form data in the xDB (MongoDB) and associates it with the current contact (used to be called visitor). I believe MongoDB is a much better choice than SQL for storing non-structured data that is generated by WFFM and in addition it can also be used to tailor the experience to the current contact (visitor) i.e. don’t show them the form if they have already filled it out, etc. Unfortunately I have a number of customers that want to upgrade to Sitecore 7.5, but due to a number of business and operational reasons are not ready to migrate MongoDB. Therefore they wish to continue storing their form data in the existing SQL database. I decided to create a simple SQL provider for WFFM 2.5, that would allow customers to continue saving/retrieving data frm the existing SQL database. 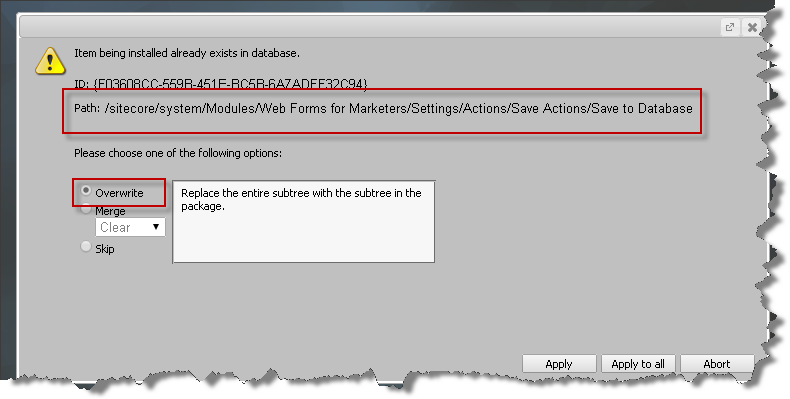 The shared source module WEB FORMS FOR MARKETERS 2.5 – SQL PROVIDER (SAVETODATABASE) is available at Sitecore’s marketplace and the source code is available at GitHub. Save data to a WFFM SQL database (SaveToDatabase Action). Retrieve all submitted data for a given form. It was my intention to port the forms report viewer from a previous version, but the architecture has changed considerably to accommodate xDB and it would have required me to re-code and override a lot of classes. In addition there were a number of UI control libraries that the forms report viewer relies upon which are no longer used/bundled with Sitecore 7.5. Therefore I intended to implement the ability to down load the data for a given form as an CSV file. So the data can be analysed and sorted using Excel, which in my experience is how the majority of customers used WFFM data. 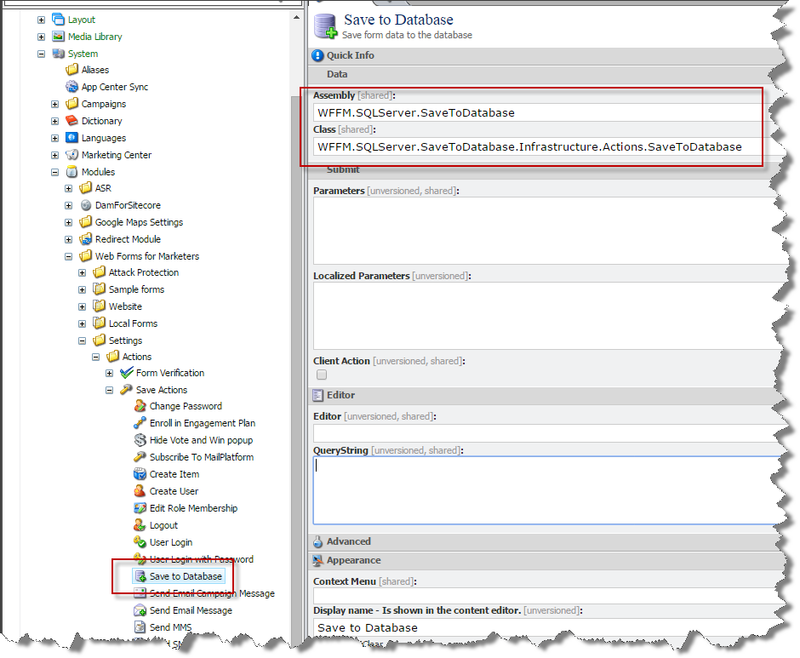 Ensure the WFM.ConnectionString settingin /app_config/include/Sitecore.Forms.config is set to the name of the connection string for the WFFM SQL database i.e. Like previous version of WFFM you use the “Save To Database” action to save the submitted form data to the SQL database. The SaveToDatabase action is still /sitecore/system/Modules/Web Forms for Marketers/Settings/Actions/Save Actions/Save to Database. In fact it is the same item from previous versions, so all existing forms that use the SaveToDatabase action will continue to work without making any changes. The only change is that class is WFFM.SQLServer.SaveToDatabase.Infrastructure.Actions.SaveToDatabase, from the WFFM.SQLServer.SaveToDatabase assembly. I have added a button to download data as CSV see this article. This entry was posted in Sitecore, Sitecore 7.5, SQL Server, Web Forms For Marketers, WFFM and tagged Database, Sitecore 7.5, SQL Server, Web Forms For Marketers, WFFM 2.5 on November 24, 2014 by Alan Coates. Over the years I have worked on lots of websites that have performance issue caused by sitecore queries that iterate over too many items, usually searching through descendants. In development where there are not too many items the query performs OK. The site goes live and they start to add content and soon there are 1000’s of items and the queries becomes slower and slower over time. A typical example is searching for the 10 latest news, articles, blog’s etc. At this point a fix is made by changing the queries to use the “fast:” syntax. There are a lot of articles already explaining this in detail, so this is just a brief intro, the fast syntax translates the query directly into an SQL server database query, and therefore for some queries it can perform faster, use less memory and less CPU. But a warning it bypasses all caching that sitecore provides and make a request directly to the database every time the query is executed; in development this tends to outperform the standard queries that would have to iterate over a lot of items. In development you usually test the normal query against the fast syntax query to establish if it is quicker and if it’s quicker you use it and everybody is happy… but that is not the full story. In development this would typically not be an issue and or not noticed, as only one page at a time is requested, but in a production on a website with lots of requests it can kill the SQL database and or slow the site down as sitecore itself cannot retrieve items form the database, as the SQL server is busy with all the fast queries. Therefore you have to be VERY VERY CAREFUL with the use of fast queries. I would say in 97% of cases – if your queries slow and it is caused by iterating over to many items the correct solution is to use Sitecore search i.e. lucene, Solr, Coveo or another indexer to retrieve the items. This entry was posted in .Net, Performance, Sitecore, Sitecore Query and tagged Fast, Peerformance, Sitecore, Sitecore query, SQL Server on November 19, 2014 by Alan Coates.